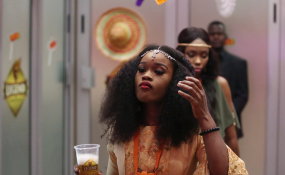 Cee-C said, "A lot of things were centered around Tobi and I; It's a good thing as the theme was Double Wahala. "It was a good thing for the show. There is nothing to regret, even when you lose, you learn from your mistakes," she said. He said, "It was one I learnt from and also enjoyed." Explaining the reason of his actions to Ebuka, he said, "First of all, I think it takes a lot to have a relationship. It takes a lot more than us just liking each other. "We had our differences and after the house, we sorted it out. We are two different people and we are looking for different things going forward," he said. About Miracle, she said, "He is just a goal-getter. He is focused and that's one thing I love about him. I don't regret the relationship at all. I actually wanted to see how it will be if I was alone." Commenting on the Nina and Miracle situation, media personality Denrele Edun said, "Miracle struck me as someone who was lost when he got into the house. "He looked out for someone who would be unsuspecting of his moves in the house. The moment they were paired, I just knew 'Okay'. "It worked in his favour and also worked in her favour. If they weren't paired together, things would have turned out differently," he said.